Holly Fisher, an Iowa native is a practicing Artist-Blacksmith who creates metalwork and teaches out of her shop  Flying Anvil Forge  in Mounds, OK.
Holly founded Smartshop Metal Arts Center in Kalamazoo, Michigan. From 2002 until 2010. Smartshop was a metalworking school, art gallery and sculpture garden. During that timespan she utilized metal art as a way to assist her community. After the Michigan economy collapsed, the school closed, but is warmly remembered by many who found their passion there. From Kalamazoo, Holly moved to Memphis TN for an artist residency at The National Ornamental Metal Museum. She was able to focus entirely on the creation of artwork. She created expressive work and drastically expanded her knowledge of blacksmithing processes. After the residency, Holly assisted the Metal Museum by coordinating their commissioned projects and educational programs for 2 subsequent years. Holly now lives in Mounds, OK with her husband, dogs, cats and horses. She is happy to have the luxury to create her art full time. When she is not hammering away, shes riding horses or volunteering at the Tulsa Boys Home. 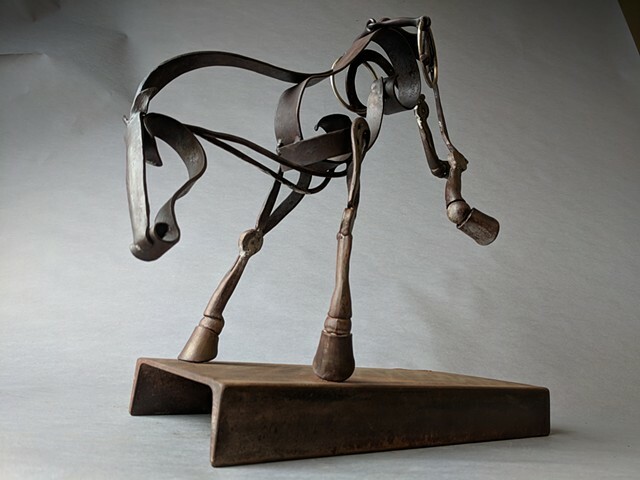 When asked about how she creates, Holly said "I most often employ traditional blacksmithing processes to create my work, but I am not afraid to employ current technologies to achieve a desired result. Metals are magical and the processes used to form them I find quite exciting and rewarding. Metal objects possess a multifaceted familiarity to humans, they are tangible markers of time - souvenirs of existence. My work at its core is intended to reflect and provoke thought  to start conversations and promote connection. My sculptures provide platforms for thoughts to be thought about, recognized, validated, processed and shared. In a perfect world, my work would provide a means for others to discover their truths and share them. In a broad view, I hope to make the world a better place by promoting commonalities and enhancing understanding." Original works on this website are copyrighted and may not be reproduced without my permission.